Roadway Express, having merged with Yellow Transportation to be the YRC Freight Company it is known for today, is undeniably such a shipping powerhouse with its highly dependable driving workforce. If you are eyeing for work in a reputable transportation company, then the trucking jobs they are offering will certainly present great opportunities for you. They are welcoming you even though you might still be quite new to the field, or an experienced applicant on the search for a greater career challenge, for as long as you are what they are looking for. If you are applying for a driving job at Roadway Trucking or is still presently contemplating the decision, then you should also be aware of what it is you are expected to encompass for the job. Being a tractor-trailer driver of Roadway is a rigorous undertaking. Aside from timeliness considerations or being on schedule, freight safety should be your topmost priority. You should be able to safely carry customer’s goods from the point of loading to the point of destination. To achieve this, you need to have the endurance to travel for long hours along the diverse routes that you are supposed to take. You must also keep communicating lines open between you and the point of dispatch. Moreover, you should also be able to communicate well with the clients. Roadway trucking is very particular with adding new people to its trucking team, which is rightly so because they have a distinguished name in carrier excellence. YRC Freight has been awarded for its excellent carrier service by reputable transportation organizations and leading magazines. It is thus quite understandable that they only want the best for their driving team. Qualifications for their trucking jobs include an oral and written English communication ability that passes the DOT standards. Aside from that, you also must be at least 22 years of age and have a full year of previous OTR driving experience. Of course, you should also be able to pass the DOT drug, company skills and physical exams test. 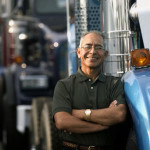 Moreover, a CLASS A CDL with HazMat and Doubles endorsements is a must. Furthermore, Roadway has always been seeking drivers who have military experience. This is because the company highly esteems the people who were willing to selflessly defend the country. Military people are also highly disciplined and skilled, which makes them responsible and dependable workers. In fact, the workforce of YRC Freight has more than 13% of such personnel. Why drive for YRC Freight? They enumerated five top reasons. First, a fully paid health care benefit plan and vacation period is in store for you. Second, all the equipment that you need for the job is provided by the company itself. Third, your daily dispatches will be adjusted so you won’t be that far away from home. Fourth, you can earn up to $60,000 even in just your first year on the job. And lastly, the experience and pride itself of being a part of the recognized driver fleet of a Fortune 500 company. Isn’t that superb? There is no time to waste. Join Roadway’s driving team!